A native of Indianapolis, there is nothing more important to Pettiford than family. He and his two younger brothers have always been close, but their relationship changed once his parents divorced. Even as a high school student, Pettiford would switch between being the fun brother who would wrestle with his younger siblings when mom wasn’t home to being more of a father figure who would get on his brothers when he needed to. It would have been easy for Pettiford to leave that all behind once he got to Wabash (which he chose partially because of how close it was to home). He now had time to focus only on himself—his athletic career, his academic career, and his social life. But he could not stand to be away from home. He’s driven home to as many of his brothers’ sporting events that he could get to. Not a birthday or a Christmas goes by without Pettiford spoiling his younger brothers. And even throughout his senior year, he would still drive home to see his family at least once a week. 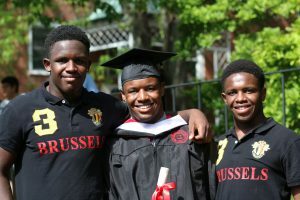 Going to college, though, might just be the best thing Pettiford could have done for his younger brothers. Pettiford’s brothers often came to campus to hang out with him and his friends and teammates. The middle brother would watch the football team at practice, and the younger brother followed all of the Wabash wrestlers and is, as Pettiford puts it, obsessed with Riley Lefever. Pettiford takes a lot of pride mentoring his younger brothers – and even their friends. For some of them, he’s the only person who has made it college and has succeeded both athletically and academically.